Create vertical shutter streaks and glows out of the light in your image with ProGleam from Pixel Film Studios. ProGleam allows you to emulate the look of a camera with a misaligned film gate. ProGleam requires Final Cut Pro X version 10.1.1 or newer. ProGleam was designed to replicate the vertical shutter streaks that are created from a misaligned film gate. These vertical gleams are great for creating energetic videos or stylized flashback scenes in a film. ProGleam is not just a simple video composite technique. 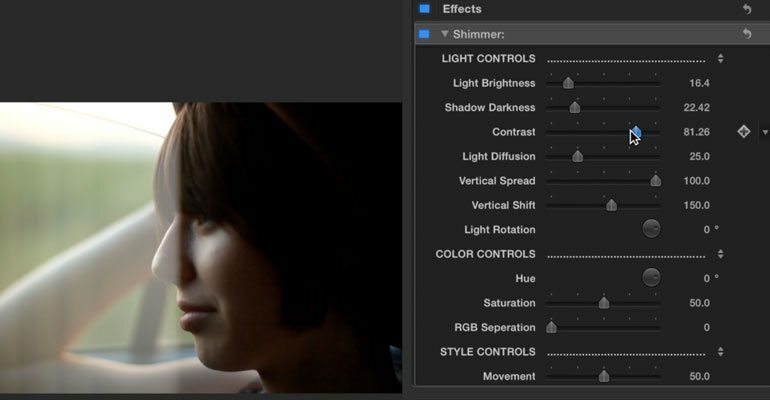 This powerful plugin analyzes your footage and works off the existing light in your film. Apply 1 of the 15 filter styles to your footage and watch as the shutter streaks move and react to the light in the footage. With 15 powerful presets and customization options, ProGleam allows you to control your shutter streak effects to work perfectly with your footage. 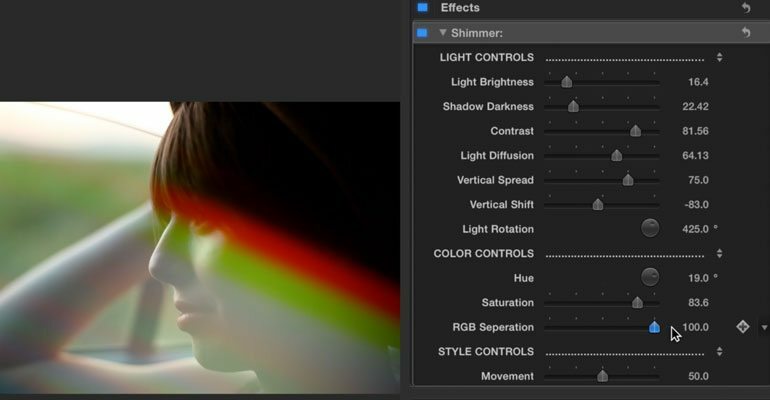 Using simple sliders, editors can adjust the spread, ray definition, color, saturation, diffusion and intensity of their light. Go from naturalistic to stylistic in the click of a button. ProGleam was professionally designed to work inside Final Cut Pro X. Simply choose one of the plugin from the library, select the effect you like, and use the FCPX Inspector to control the look. ProGleam requires Final Cut Pro X version 10.1.1 or newer. Learn how to create and customize your very own professional shutter streak filters with the ProGleam Lesson. 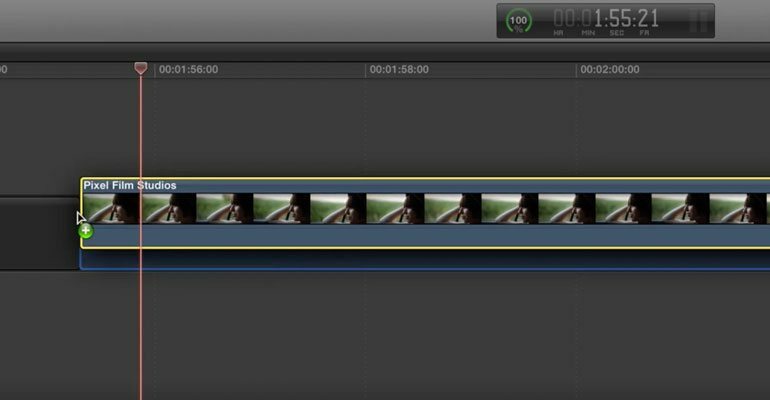 Let’s begin by selecting our footage from the FCPX media library and dragging it to the timeline. Then locate ProGleam in the Effects library. Browse through the presets and choose a style that fits for your project. For this example we will be using the shimmer preset. Drag the preset directly on top of your media. Then Select your media and go to the inspector window. Once you have your timeline set up start by adjusting the light brightness, shadow darkness and contrast in the Light Controls section. Next, Adjust the light diffusion, vertical spread, vertical shift and light rotation. The Light diffusion slider will bring the intensity of your light down the more you move the slider to the right. Once you have the Light Controls customized to your liking move on to the Color Controls section. In this section You can adjust the hue, Saturation and RGB Separation. You will get different colors of light by rotating the wheel. The RGB Separation divides the reds, greens and blues. By the sliding the slider to the right it will make the reds, greens and blues noticeable as well as larger in size. Now for some final touches. Located in the Style Controls section is the movement slider. The movement slider controls the light rays. Keyframe the movement slider to add more life to your media. Where do I find ProGleam? Once the installation is complete, you can find ProGleam in the FCPX effects library.